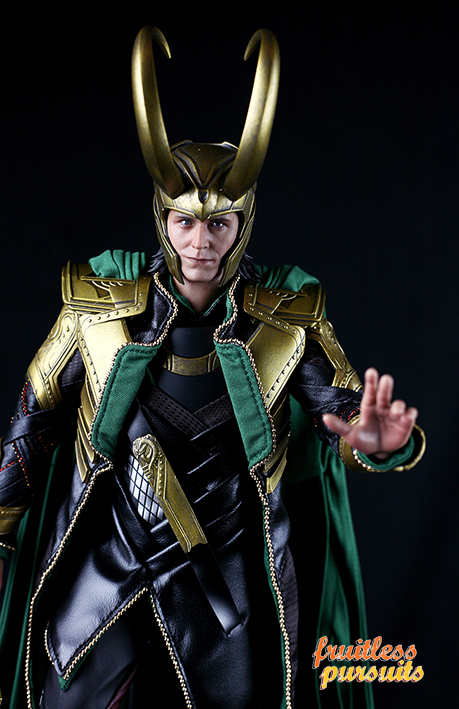 Fruitless Pursuits: Review: Hot Toys Loki (The Avengers) 1/6th Scale Collectible Figure! Review: Hot Toys Loki (The Avengers) 1/6th Scale Collectible Figure! Seriously, this late in the game these reviews are such a no-brainer. You already know that I love them, right? Just look at that crazy picture! Hot Toys are at the top of their game! But you will want to see a LOT more pretty pictures and find out more about this gaunt, greasy, mischief-maker... after the jump! This one does at least look a lot more sinister though, right? Actually he's got those mean eyes like he's drunk. "Whaddyoo saytome, mate? I'm teh fugginprinceoflies...."
And once inside it's all serious business. Look at how daunting and complicated this thing is. You actually have three trays, one holding the figure, one holding the staffs, and under that the massive cape. Be sure to read the instructions before doing anything. You're definitely going to need help attaching both the helmet and cape. Dive in blindly and you'll break something. And then you will cry. And you don't want to be crying over a doll in front of everyone. On the left are two knives/blades like the ones he gets stabby with towards the end of the film. Next to that is the muzzle that he wears once he's defeated, and the big round gold things are handcuffs. I haven't photographed him with any of these, because by the time I got him all suited up I just did not have the energy. I have no desire to display him shackled and muzzled and, as cool as Hot Toys is for giving us options, it's hard to imagine that anyone would go this route. Plus, due to the overly complicated costume, he has very limited articulation, and I wasn't prepared to struggle to get him into the cuffs. My initial reaction is that his head is a bit too small for his body. Tom Hiddleston strikes me as being pretty slender, but Loki here is kind of large and a little bit ape-like. This has to be one of the more elaborate costumes that Hot Toys has ever attempted and it consists of multiple details and layers that flash by quickly in the film. Multiple fabrics and textures have been used (just check out his waistcoat and chestplate, for example) and he has beading, ribbing, and the armour has a lot of embossing. Listen to me getting all Project Runway! You're fabulous, Loki! Make it work! Even the boots are unique and highly detailed. Look at all those odd shapes and rivets! Which is a little bit impractical to display and was no doubt an impractical prop for the actor. And he is also packaged with a magically shortened version that I imagine is far easier to handle. I'll show you that later. And here's how he currently looks in my display. Complete with incongruous, "These are not the droids you're looking for," gesture. So yes! This is another win as far as I'm concerned, and surely the pictures alone are going to let you know if he's worthwhile. The bad news, of course, being that he's already sold out at Sideshow. But that's okay, because he's still available from our pals at Big Bad Toy Store. But seriously, when it' stuff you want you totes need to pre-order! More Hot Toys reviews coming very soon - they all seem to be flooding in at once right now, so stay tuned!